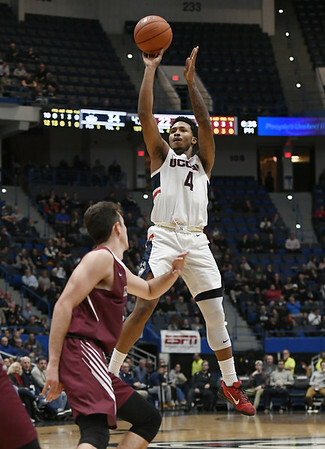 HARTFORD - Jalen Adams scored 21 points and Tyler Polley added a career-high 16 to lead UConn to a 90-63 rout of Lafayette on Wednesday. Christian Vital had 14 points and Alterique Gilbert dished out a career-high 11 assists for the Huskies (7-2). Paulius Zalys had 13 points to lead Lafayette (2-6). UConn never trailed, but Lafayette was able to stay with the Huskies for much of the first half. An offensive rebound and layup by freshman Sean Good brought the Leopards within four at 18-14. The Huskies scored the next 12, with Polley providing the final 10 points in that run. The 6-foot-8 sophomore had 13 points in the half, a point better than his previous career high. A pull-up jumper from Adams gave the Huskies their first 20-point lead at 45-25 and UConn went into the half ahead by 16 points. A rebound and layup by Brendan Adams gave UConn its first 30-point advantage at 69-39 and coach Dan Hurley gave the end of the bench some playing time soon after that. The Huskies have another big test on Saturday against No. 11 Florida State at the Never Forget Tribute Classic at the Prudential Center in Newark, New Jersey. Posted in The Bristol Press, UConn on Wednesday, 5 December 2018 21:18. Updated: Wednesday, 5 December 2018 21:20.